Description: Simply Stunning! Prestigious Riverfront Estate on the Fox just west of Barrington Hills! This Dream Home has more than 7800 square feet of elegant, well designed yet comfortable space on three levels. Sited on a sloping 1.5 acre hillside property the home offers stunning views of the river and beautiful landscapes from every room. A stream, waterfalls and ponds, are surrounded by patios and pathways, and hundreds of shrubs and perennials of every kind provide a serene setting inside and out. Nearly 130′ of deeded riverfront are yours offering recreational activity of every kind in all seasons – boating, fishing, swimming – with your own boat house and docking space for pontoon, jet ski, and speedboats. This home is the center of entertaining, on the water, in and around the beautiful grounds, and large, comfortable rooms for entertaining with family and friends. So many beautiful features to this home – you simply have to come and experience it for yourselves! Agent accompany. Description: Introducing T’Laura Cove – a slice of paradise on the Fox River. 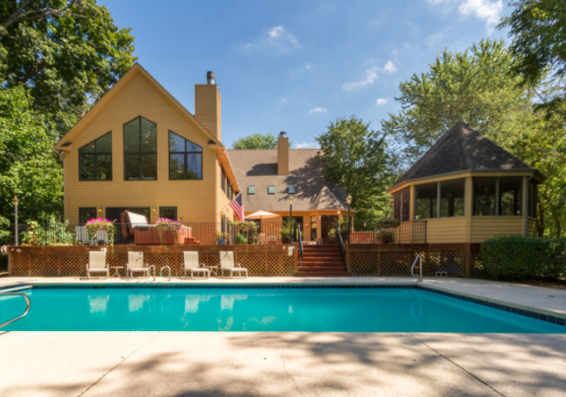 This gated Retreat, located on the Western border of Barrington Hills and spanning over 6,000 square feet, offers a fantastic open floorplan and panoramic views of the Fox River which leads to the Chain O’Lakes. The home boasts a grand Kitchen, striking Great Room with multi-sided fireplace and 2 first floor Master Suites. The larger of the 2 Master Suites offers a cozy fireplace, artistic Bath, covetable walk-in closet and access to a semi-private balcony. This property was designed with entertaining in mind – open the sliding doors, located off the Kitchen, Great Room and Master Suite to your expansive natural redwood deck with screened Gazebo, deluxe Outdoor Kitchen, complete with a 4-Burner Grill & 2-Burner Gas Stovetop, warming drawer and mini-fridge, Hot Tub, Fire Pit + an in-ground pool that overlooks the shared docks on the Fox River.